ArkLetter 83-- January 23, 2012 For an introduction to Tarotlogy, see ArkLetter 62. Click the icon below for a blank tarotlogy chart to work on for yourself. I don't know about you, but since we have crossed the Solstice, the increase of the light in our southern Washington location has become palpable. Perhaps it's because I live so far north, but the joy of every day being longer than the last has been heartening. And now that the Sun has finished traversing Saturn's first of two contiguous signs, we can begin to see the light at the end of the tunnel, even if it's by no means warm yet. Weeds are sprouting in the soil of my greenhouse -- a sure sign of nature's quickening. We are still enjoying the charmed moment before Mars goes retrograde for two more days. Since Jupiter straightened out on Christmas day, there have been four blessed weeks with not a single planet suffering from that bent-energy condition. But on the 24th of January, Mars slips behind the Sun's aura, and then on February 7th Saturn follows suit, which reminds us again of that old familiar feeling of struggling uphill against gravity. I tend to think of planetary retrogrades the same way I think of reversed cards in the Tarot. The energies are presenting in a paradoxical and perhaps contrary way, but there is a lot to learn from going through the experience they are offering. For so many, our challenges are what make us strong and bold, canny and wise. So let's get ready for a dose of training from Mars and Saturn! All in all I was impressed how well and truly Etteilla's students held to their teacher's own words and intentions, although it seems clear that Julia Orsini is the more psychological thinker, while D'Odoucet is the one with the focus on making the Masonic connection. 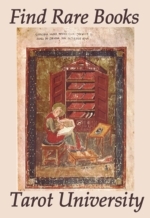 It is also clear to me that Papus prepared Etteilla's translation of Divinatory Tarot as a way of inserting some subtle "corrections" into the model, much the same way that Levi's translators took advantage or his death to insert their own teachings into his texts when they brought his works into English. I find this trait of revisionism rather revolting, but there seems to be no way to get away from it. I’d better get used to the idea that when I'm gone, it will be said of me that I "rewrote history in my own image" as well. 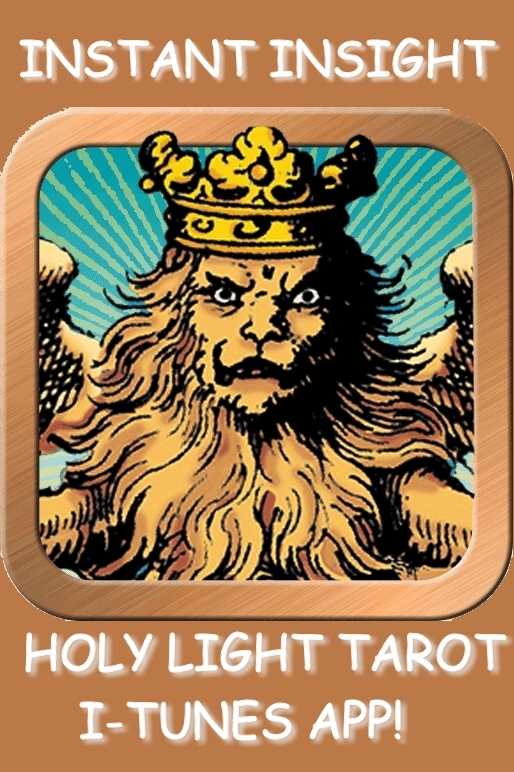 This month I'd like to point out two oracle packs that are compatible with, and literally hook directly into, the Tarot of the Holy Light Icon. Our focus at this site is primarily on the formal Tarot, but the card pack format is so popular, and it has reached so far out into the historic divinatory stream, that now we have packs of cards that pick up where the Tarot leaves off. The two packs I'm going to mention expand the divinatory cosmos defined by the Tarot, while adding insight from their own independent realms. One such pack is The 72 Names Cards. This pack can comfortably cohabit with any 78-card Tarot pack, since it represents a circle of angels that spans the Zodiac, two angels for every decanate (thus two angels for every Pip from ace to 9 in the THL). The root of all the Mysteries of the West is Astrology, which means that once one converts the Oracle in question back to its astrological basis, then it's not hard to figure out the connections between one tool and the other. This is how both of these Oracles make their linkage with the THL Icon. The 72 Names are an ancient construct deduced by the alphabetarian magi of the Old Testament. These angels appear out of a special alignment of three contiguous chapters from the Book of Genesis, as spelled out in Hebrew. I have written about the larger phenomenon here: http://noreah.typepad.com/tarot_arkletters/2007/03/shem_angels.html. These angels have been part of the magician's kit since St. Dionysius the Areopagite brought them into the Christian canon from their ancient Persian source. There are a number of presentations that have been made about the 72 Names on the Internet, in book form and also in card pack form. I have used these Angel Names for years as a part of my investigations into the root values associated with the cards, and to understand the thinking of the Tarot magicians who have associated their suit cards with these values. Recently I was gifted with a pack created for these Names by Orna Ben-Shoshan. I don't think this pack is new; Ben-Shoshan is the creator of several fascinating and cunning oracles, including the King Solomon Cards and the Wheel of Wisdom. (Reviews of both to be found at http://bonniecehovet.wordpress.com/tag/orna-ben-shoshan/.) What makes her work stand out is that she has steeped herself in the spiritual praxis of the Holy Land and the living presence of the Invisibles. Then she has very creatively brought these energies forward into modern dress for us to converse with. I find her whimsical and evocative art style to be quite magical, while her analysis of the energies represented by the Angels is psychologically, emotionally and motivationally apt. What Ben-Shoshan doesn't do is engage in any long drawn-out explanation of the Angels and their linguistic roots, nor does she catalogue all of the various correspondences they have accumulated over the centuries, nor the long florid lists including what they rule and can accomplish for humans. She also doesn't traffic in good ones and bad ones -- it seems that all these angles are moved by beneficent urges. (The traditional sources where this information can be found are in the above-mentioned article.) Where Ben-Shoshan excels is in creating a visual dreamscape for each Angel, and in suggesting approaches for bringing these energies into our daily lives through our attitudes and our intentions. Using the interpretive frame of Perspective, Direction and Bottom Line to explain each Angel, Ben Shoshan nudges and supports her readers into making that next shift of angel-mediated consciousness. I can tell you that every time I pull out these cards, I get a dynamite little reading, which I can use to investigate the degrees my Tarot cards represent and amplify what are telling me. Today’s 3-card draw accurately described a situation that was acted out in real-time just two hours later when the mail came. This has been my experience every time I've shuffled this cunning little pack. Ben-Shoshan's explanations are tight and focused, just like the angels themselves, who each represent 5 degrees of the zodiac. It's quite easy to mark in the booklet those degrees ruled by each Angel, and in that way you can quickly tie these cards back to the THL Icon, or to any pack of Tarot cards that makes angelic connections. Among the modern Tarots making use of the Shem angels, the more obvious examples are the Papus Tarot, Tavaglione's Stairs of Gold, the Kazanlar, and The Hermetic Tarot by Godfrey Dawson. In effect, Ben-Shoshan's 72 Names oracle connects the user with a celestial ally to assist one's movement out from the Tarot reading into a personal world of vision. These angels aren't generally featured as part of the divinatory net that gives meaning to the cards, but they are often employed by occultists as operative influences to help empower theurgic and magical applications. We can think of them as allies, friends, and astral servants dedicated to assisting us in our spiritual evolution, just as our ancestors have for millennia. The other pack that interlocks with the Tarot of the Holy Light (and all the oldest Tarots) is The Paracelsus Oracle Cards from Lo Scarabeo. These 32 allegories first emerged in a book of prophecy printed in Hamburg in 1536, five years before Paracelsus died. I have been turning this little oracle pack over in my mind for over a decade now. This pack manages to collate a number of different sets of esoteric symbols, but it's a challenge to cleanly delineate the logic for assembling the particular range of correspondences that converge on these cards. I haven't found all these ingredients together in any pre-modern source so far, so I can't say if these different symbol-sets originated from related roots, or whether they are originally separate and only appear here together due to a modern impulse. My first resource for comparison was a Kessinger reprint called The Magic Figures of Paracelsus by Franz Hartmann. It's actually an extract from a larger book (with no context given), but it does have all the images in the right order with their correct quotations. Because there is quite a bit of white space around a very small bit of information per page, the best use for this slim volume is to provide a journal of sorts, upon which one can tabulate notes and discoveries made when digging out more information about these cards from other sources. Recently I found the titles for these images, and also the full text of the book they were extracted from, over at http://www.rexresearch.com/paracpro/paracpro.htm. It's called The Prophecies of Paracelsus, in translation from the German by J. K., and published by William Ryder and Son in London, year 1915. The titles for the images are certainly evocative and therefore most helpful, but the explanatory text in which these images and remarks are couched (written by both Paracelsus and Eliphas Levi) requires quite a bit more specialized study before it's significance will be fully revealed. Traditional Geomancy, an ancient oracle system from pagan Europe, sheds light on a different part of the astrological model entirely. The sigils of Geomancy take their interpretations from the seasonal and elemental grid of the Zodiac, the cycles of the Planets and the agricultural year. These 32 cards make two recitations of the 16 figures of traditional Geomancy, half of them set against daytime scenes and the other half carrying a darker aspect. The listings of traditional significations for these sixteen sigils (which are repeated twice in tandem with Paracelsus' 32 unique images) reveals counsel for managing family and friendships, the fluctuations of work and financial challenges, Church affairs, travel for business and pleasure, romance and issues of mental and physical health. The Geomantic sigils are also given astrological houses in which they are most comfortable, as well as methods of permutation that create "daughters" from "mothers" and extend a single reading into multiple areas of life. Clearly Geomancy was a clever way of hiding formal Astrological values in low-tech, seemingly random and magical form. The Paracelsus Oracle offers a great little tool for manipulating this symbol-set both within it's traditional operations, and also in new contexts that the old book-based application couldn't enter. To make sure I was dealing with a body of standard correspondences for the Geomantic sigils, instead of one person's eccentric interpretation, I also cross-compared the section of Book T that covers Geomantic Divination, with John Michael Greer's Earth Divination Earth Magic; A Practical Guide to Geomancy. On Greer's page 27, in Table 2-1, he gives the key to the astrological assignments of the 16 Geomantic Figures. These assignments are the classic and ancient Ladder of Lights arrangement, with the visible Planets assigned two signs each, while the Sun and Moon each own one sign. We see this arrangement at the center of the Tarot of the Holy Light Icon, since it’s the guiding model for the whole scheme of Essential Dignities, anciently called the Stoicheon-Somata Schema. It's fascinating to see these 32 Magic Figures combined with the traditional geomantic sigils and their fundamental astrological cognates. The cards also show a set of "spirit signatures" that have traveled alongside the Shem angels through the centuries. These are said to refer to the "flip side" or demonic aspects of the Angels. (Hmmmm, that idea is worth a ponder itself!) The LWB for the Paracelsus Oracle also gives us each card’s relevant upright angel-name from the Shem sequence, along with short remarks about the divinatory meaning of each card in the Paracelsus pack. Since there are only 32 cards in this little set, and we know there are 36 pairs of Angels whose sigils and/or names have appeared on the aforementioned packs, it seems clear that some angels will not be represented. Oh well! We must accept the pack at its face value and enjoy whatever benefits it can be seen to provide in practice. As you can imagine, by the time the whole catalogue of influences is tallied, this little pack of 36 cards turns out to be a fairly power-packed little esoteric tool! But for daily, practical use, probably the most accessible way to deploy the Paracelsus Oracle cards will be to pay attention to the Planetary Rulers, both on the Paracelsus Oracle cards, and on the Tarot of the Holy Light Icon. As I have said in other contexts, the Planets turn out to be the active ingredients, the knobs and dials (so to speak), of the whole esoteric paradigm, whether one thinks in terms of Hermeticism, Cabbalism, astrology, operative magic, sacred geometry, or Tarot. By re-attaching the Paracelsus Oracle card you have drawn to its Planetary Ruler, you can then watch that influence playing out across your Icon, both through the astrological transits overhead and from drawing cards from your various Continental decks. The author of the Introduction, Gina di Roberto, has a very wise piece of advice for us when reading the upright cards versus their reversed aspect. I will share it in full here because it is so apt for using ANY oracle deck in ANY situation: "If a card is upright, this means that the Querient is the 'driving force behind the action'; that is, he or she acts, whether good or bad, willingly. If a card is upside-down, this means that the Querient 'undergoes the action': that is, someone or something influences his life, acting in the way indicated in the figure." Now we can see the similarities and differences between the 72 Names oracle and the Paracelsus Oracle. Once the foundation-ground is examined carefully, it is clear that each pack refers to the Angels, but each in their own way. The 72 Names illustrates and artfully suggests psychological, psychic and emotional states that are acknowledged and dealt with first in the inner life. Ben-Shoshan doesn't judge between good and bad, light and dark angels, giving each Angel the space to expand and demonstrate its own realm of action. The 72 Names cards encourage us to witness the angel's aid, understand how it applies, and move lightly through the resulting opening. At least that's the way my psyche responds to the combination of image and text that Ben-Shoshan has created for us. The Paracelsus Oracle employs the same antique material (Shem Angels), but splits them down the middle; half the sequence comprises enlightened, helpful forms, whereas an equal and opposite set holds assumed difficult dark sides. This is quite likely our biggest clue that the collection of symbols on the Paracelsus Oracle reflects a more ambiguous and shades-of-grey approach to navigating through life. This pack acknowledges a "dark side", and it even details its denizens. It includes Geomantic Sigils that make reference to the Planets and Houses, which gives us a context for applying their energies to our daily circumstances and traditional realms of life. We also get a stern admonition from the allegories of the Magic Figures, which come to us as visual parables of Paracelsus’ magical thought-remedies. In this sequence we are showed a range of more earthly and tangible influences, which exist in a reality further removed from the astral plane and more deeply affected by politics, personality, ego-contention, and material circumstance. I am tempted to say that Orna Ben-Shoshan's 72 Names Cards point the user into the Astral plane, where energies just a few frequencies above the human spectrum await our discovery of the angel host. Alternately, the Paracelsus Oracle Cards point into the elemental and material realms, where the ambivalent tailwinds of angels and demons contend in a world that fluctuates between dark and light, marked by regular cycles of expansion and contraction, waxing and waning. If you put your Tarot of the Holy Light (or any other Marseilles or Continental Tarot) in between these two Oracles, we begin to get a sense of the sophistication that an occultist or magician from the 1600's and 1700's could bring to their Tarot experiences. All of these symbol-sets -- the Tarot, the Magic Figures, the Geomantic Sigils, the Planets and Houses, the pure Angels as well as traditional personifications of their benign and demonic aspects -- all of these ideas have been sharing space in the European Imaginal since the Renaissance. I love being able to shuffle these packs together and construct a collage for myself from the combination. And once one's multi-modal magic collage is complete, it can all be recorded on the Icon, by making notes in the positions where their Angels (or Demons) would naturally fall around the Zodiac. Click on the Tarotology icon to see this January 2012's NewMoon Tarotology chart and follow along with the explanation below. I love the THL Icon! Every month new uses show themselves. As you can see, above, it links into other mystical systems that are part of the larger tapestry of the magical transmission. It also explicates the traditional astrological universe to the world of Tarot. In the case of our NewMoon ArkLetter analysis, the Icon also allows us to differentiate between things that are moving so slowly that they have made virtually no change since last month, versus things that are climbing around the decanates fast enough to show up as a "new reading" from the Tarot of the Holy Light. NewMoon in early Aquarius = Priestess and Fool in the realm of The Moon, occupying the decanate of the 6 of Swords (ruled by Saturn). Neptune as cosmic Water/the Death card stands at the very last degrees of Aquarius as well; 5 of Swords, the same as last month. Aquarius is the sign opposite the Sun's natural sign (Leo), so this month the Sun is "in its detriment". This is obvious in the Northern Hemisphere, since we are currently still having much longer nights than days, and in the daytime the Sun is wan, thin and barely warming. However, our energy has to go somewhere, so while we might seem dormant regarding external activities, we are very busy in our imaginations. Aquarius is the time for making plans and outlining goals that will be lived out later in the year, when the energy for outward projects has returned. Right now these commitments are still in the realm of the ideal, but even now we had better be practical about exactly how much of ourselves we want to give away. The battle between the Lion and the Eagle in the 6 of Wands can stand for the communitarian side of us (the Lion) lining up against the freedom-loving and highly individualistic side (the Eagle). Don't promise now what you will resent having to deliver later! Remember that the Death card is sitting at the end of this sign, meaning that both the Moon and then the Sun will have to cross the great Dissolver. Any goals or ideas that cannot pass under the Reaper's blade without being fatally edited will never see the light of spring anyway. Another consideration comes because we have reached the point in the Zodiac where the temptation to enter the "wet way" comes upon us. This goes back to the ancient myth of reincarnation. Imagine -- your disincarnated soul flies by our world, and thinks, "Doesn't that look interesting!" It heads for a doorway marked with the sign for Aquarius, which is the entrance to this fun ride. This sign's ruler Saturn stamps your astral passport, and then you are whisked to the gateway of Jupiter (Pisces). And so it goes, each of the Planets in sequence gives you its mark, and your passport fills up. Mars (Aries), Venus (Taurus), Mercury (Gemini), and then you reach the sign of Cancer (Moon). This is the Gate of Birth, and here you are labored upon and then dumped into the world as we know it. The marks on your astral passport translate into qualities and characteristics, karmas and lessons that need to be learned. You will now wander in the fun house until you can find the 'coin of the realm' to pay off your planetary sponsors, starting with the Sun (Leo), and rising back up the Ladder again; Mercury (Virgo), Venus (Libra), Mars (Scorpio), Jupiter (Sagittarius) and then finally Saturn again (Capricorn), who attends the Gate of Death. This second sequence from Leo to Capricorn is called the "dry way", and it represents the process of detaching from and becoming cured of the very attributes and characteristics we first accepted from the Planets when we entered into this world. The wet way engages the emotions and attachments, and the dry way disengages them again. This is a very ancient teaching about the two sides of the Zodiac and why the Ladder of Lights system works the way it does. It also unveils the soul's dilemma in matter and the path to resolving it. What we need to remember as we stand at the Aquarian entrance-gate is -- don't go down that road of relationship and enmeshment in the world and its struggles unless you are willing to give it your all! Either hold back firmly or fully commit, because once the Wheel turns and we tumble from the heights of Aquarius down the slide into Pisces and beyond, there will be no stopping the chain of consequences and karmas, and it may take us years or eons to untangle ourselves again! Mercury in late Capricorn = The Star in the land of the Tower, occupying the decanate of the 3 of Disks (ruled by Mercury). Pluto as cosmic Fire/The World occupies the first decanate of Capricorn as well; Ace of Disks, ruled by Saturn, the same as last month. Here is a delicious visualization that rises naturally from these alchemical illustrations. The Tower card shows the Alchemical furnace, with its suspended vessel raised high above the landscape, attracting and accumulating the forces of Sun, Moon and Stars. A special new substance/intelligence is culturing in that sealed womb, which has an opalescent glow and sheds a gentle light into the landscape. Nobody knows how long it has been collecting these celestial energies or what is culturing in the vessel, but everybody has an opinion, or has heard a story about it. Demons and bug-a-boos of politics and partisan bickering fly around the Tower, attacking it with accusations and misrepresentation. These entities don't possess any special insight, but they are sure that they don't like what they see nonetheless. Others know the value of the substance in the vessel, and have stripped down to their loincloths to try and break into the Tower and steal the riches before the experiment is even completed. When the consummate moment arrives, a bolt of Lightning rips through the firmament and shocks all the participants, sending the connivers and complainers flying, and toppling the crown of the Tower. A blazing Fire proceeds to melt the whole structure to the ground. When the heat dies down, and the curious come around to see what remains, what they see is the Mercurial figure of the Star holding a few magical pentacles she found buried in the ashes (the Ace and 3 of Disks). What of any value is left when all of the temporal aspects have been immolated by the fires of time? Whatever she's holding, you can take it to the bank! Venus in mid-Pisces = Empress in the land of The Sun, occupying the 7 of Cups (ruled by Moon). In antiquity, Venus was deemed to be exalted in the sign of Pisces, and we can see this in the sense of ease and relaxation that shines between these two Trumps. The Empress' creativity is unfettered here, and no Censor enters to disrupt the picture. Apollo has opened the gates to the walled garden, allowing all and sundry to explore the multiple options and aspects of reality. In mythology, Apollo's lyre allows him to walk through the land of the dead (passing through the "underworld" during our terrestrial night) and appear again the next day unscathed. This is the significance of the Sun in the sign of Pisces and the 12th astrological House, which is traditionally the realm of death and endings. Apollo announces the immortality of the Soul in time (the Zodiac), and highlights the spiritual freedom of those who have finally penetrated to the state of pure Being. Since Venus is traditionally associated with 'The Light of Nature', meaning the Intelligence shared by all sentient entities of whatever species, we have here a combination that has the potential to be both illuminating and inspiring. But first we have to win our consciousness back from the Hydra-headed attention-sapping chimera of distraction that our culture lays out before us! If each one of us just reclaimed one hour of our time and attention per day, and used it towards our own fondest wishes rather than letting it be consumed by the Hydra, then this time next year we'd be 365 creative hours farther along towards our visions and dreams. Mars in late Virgo = Strength in the land of The Wheel; 8 of Disks (ruled by Venus). Last month Mars was in the middle degrees of Virgo, which therefore evoked the scrutiny of Saturn. This month he's at the end of the sign, and now Venus permeates the atmosphere. I'm glad to see this because Venus is the complement and spouse of Mars in the ancient Stoicheon-Somata schema. The hope would be that her moderating influence might allow the onset of Mars' retrograde period to happen more calmly and with less confrontation. In the course of the retrograde, Mars will penetrate back into the Saturn decanate again, but at least the moment of the turning is cushioned by Venus' softer attitude. Since the 8 of Disks is so often illustrated with the idea of "spending time at the workbench", this gives us a hint of the strategy to use as Mars turns on his heel in the exacting sign of Virgo. Like a master carver or painter does, it will soon be time to go back over our recent labors and add another layer of polish and refinement to our projects. Patience and exacting attention to detail are the watchword of this coming time. Jupiter in very early Taurus = The Emperor in the land of the Lovers; 6 of Disks (ruled by Venus). Jupiter's time in Taurus has been complicated by his retrograde, but now that phase is done and he can proceed in a forward direction while appreciating the harmony of Venus' native domain. Although Jupiter has stressed Venus with his touchy attitude over the last few months, the Emperor is now complimentary and gracious towards the well-appointed realm of the Lovers, replete with every pleasure. The Platonic Solids on display in the 6 of Disks give further testimony to the harmony and stability of Nature's building blocks, the numbers. Here in the realm of the Good, the True and the Beautiful, the Emperor learns to fully appreciate the value of order, despite his tendency to attract "too much of a good thing" wherever he lingers. The balance and reciprocity with which she governs her realm allows for a fertile and diverse culture. But the Emperor must never forget that if he were to become aroused and start expanding as is his wont, he could crush and upend her domain as easily as if it were a gingerbread house, or the paper backdrop for a shadow-puppet show. Great self-control is required for him to stay appropriate and keep his insatiable nature contained. At this very early point in Taurus, Jupiter is within just a few degrees of a perfect inconjunct with Saturn. We've seen these two engaging stressfully and taking each other to task since their approaching set of inconjuncts started in March 2009, so it's not entirely a surprise. This is the final event of a two-year period during which they had an initial set of inconjuncts from Virgo to Pisces, then endured multiple oppositions across Aries and Libra, and now are finally exiting this dance with concluding inconjuncts between Taurus and Libra. It's all but over now -- soon Jupiter will go rushing across Taurus on his way to Gemini, while Saturn is due for a long retrograde, retracing his steps across the second half of Libra. This episode is the final perfection of their conversation over the last few years, an exchange that has been marked by confrontation between the inspiration to expand (Jupiter) and the necessity to contract (Saturn). I'll say a few more things about this below, but right here it becomes clear that we must make our peace with the paradox of matter, because if we can't factor that contracting urge (Saturn) into our attraction for "more" (Jupiter), we will never make the needed compromises with Reality. Saturn in very late Libra - Judgment (or Resurrection) in the land of the Hanged Man; 3 of Swords (ruled by Mercury). Saturn is exalted in Libra, but his annoyance with Jupiter is causing him to re-think his orientation towards the voluntary simplicity discussed last month. The path that Jupiter took to arrive at this inconjunct could be seen by Saturn as self-serving and short-sighted, in that Jupiter has found excuses (his retrograde) that allow him to back out of a range of commitments that had previously seemed set in stone. This looks like situational relativism to Saturn, who won't take a position he isn't willing to hold for years, or even for a lifetime. So now Saturn is stressed and irritated, and looks for sympathy to the NewMoon (which is also feeling stressed towards Jupiter by square). Perhaps Saturn wants to see the Lights render a Judgment against Jupiter's lack of predictability and follow-through, making an example of Jupiter "for the edification of the larger whole". The Aquarian insight of both Sun and Moon will need to ponder over this appeal and find a wise course to walk between the extremes. In fact, very soon now this whole dilemma will be dissolving, because Jupiter is picking up pace and will be moving briskly away from this aspect. Meanwhile Saturn's upcoming retrograde will turn him into the one who is backing out of his stances and downsizing his expectations. What goes around comes around! The lesson is, don't get too righteous about other people's shortcuts or fudged promises. We all need the benefit of the doubt from time to time. We mustn't become too outspoken about violations of our so-high standards in the presence of other's failings, lest we come to rue the day when we find ourselves judged and found wanting by the very same standards. Saturn challenges us to remain fair and equitable under all conditions, so that we can rest secure in our expectation of being treated fairly when our own time of accountability comes along. Uranus in early Aries = Cosmic Air/Magus in the land of the Hierophant; in the decanate of the Ace of Wands (ruled by Mars). This is just as it was last month, and will be for months to come. I don't really favor using the concept of the Outer Planets for the three Alchemical Elements, so I'd rather say "A breath of Cosmic Air is bringing a fresh awakening to the spring sign portrayed by the Hierophant". This points towards the global revival of the ancient yogic, spiritual and esoteric skills of the shaman. The THL Hierophant is being portrayed here as Hermes the Thrice Born (a Reincarnated Initiate). His presence might presage a return to a do-it-yourself ethos that encourages us all to talk directly to Spirit without intermediaries. It might also be representative of shift in consciousness matching the geological and solar changes we are experiencing these days; it's all part of a new spiritual impulse that is sweeping human awareness. The Hierophant points to the very ancient archetype of the self-initiated healer and spirit-walker, who finds his or her own way into relationship with the invisible, and doesn't need a teacher to make effective contact and bring back substantial remedies of one kind of another. According to some legends, the Hierophant has reached the point where every incarnation sees this soul taking on the same works -- that of spiritual midwife to humanity. There is no more trying-on of different identities, genders and roles from one lifetime to the next, but only an early calling, a powerful interior orientation that cannot be denied, and a return to the healing and priestly arts, again and again. This is called the Bodhisattva path, or the path of the Saints. With this Trump bringing a fresh upwelling of motivation to this Mars decanate of this Martian sign, there should be a great acceleration in the rate that people are coming awake to their higher senses, and beginning to receive direct messages from Spirit. The governing figure of this NewMoon chart takes its base from the Jupiter/Saturn inconjunct, with NewMoon at the midpoint squared to Jupiter and trine to Saturn. This is one half of the action for the next month. The other half is a similar 3/4/5 triangle that uses the same Jupiter/Saturn base, but this time it has Pluto at the apex. This second triangle has its square side between Pluto and Saturn, and its trine side between Pluto and Jupiter. There's a semi-sextile (30 degrees) between Pluto and NewMoon. What this adds up to is a double-headed beast with NewMoon leading forward into Aquarius and beyond, while Pluto holds firm and presses his claim from Capricorn. The Sun and Moon are the monthly pulse of Life and Light, while Pluto is the Lord of the Underworld. It sounds to me like humanity owes a debt to the earth, which Pluto in Capricorn is not going to let us skip out on, no matter how fervently we want to slide away and head for the hope of better times ahead. As was mentioned above, Aquarius is the gateway into a fresh incarnation, traditionally speaking, whereas Capricorn offers 'get out of jail free card', the tantalizing possibility of moving beyond the world's claims and obligations. Saturn is the ruler of both these signs, so he is the final judge of who shall pass and in which direction. We are put in mind of the mill wheel of Time, the Wheel of Fortune. Until Fortune smiles upon us, our fate is to be ground ever-finer between Saturn's great stones, to become flour for the bread of the heaven. Given that this figure is grounded in a Jupiter/Saturn inconjunct, and Saturn coincidentally rules the signs where both "heads" of the figure reside, I think it would be wise for each of us to consult with our own conscience, the karma-lord within our consciousness. It's time to see if there is anything we can do to satisfy Pluto's sense of debt and obligation to the past. If we can determine where it is that we are wanting and attend to those issues straightforwardly, we give Pluto reason to release us into the hands of the NewMoon impulse. We want to use this coming month to win the karmic freedom to go forward confidently. We don't want to be dragging bits of unfinished business behind us that can pop out of nowhere sometime in the future and eat up our substance like hungry ghosts! BTW - Downloaded the Etteila info from Aeclectic - thank you for the heads up! I hadn't gotten tot he forum yet! I think the folks working in theurgical mode would calculate the angel on the Ascendent at the moment of the working, and address that when the circle is cast. Nothing wrong with doing the same for the quinary angels of the Sun's location and the Moon's location either. Plus these angels are the ones to petition for "getting things done". There's lots of resources on these guys too, in terms of powers and qualities and that sort of thing. One finds their names on pentacles and talismans as well. The conversation over at the Aeclectic Tarot continues. I'm so grateful to have such high-quality people to discourse with, on one of my favorite topics, no less. Just a note for those stopping by: Here's a readout from my favorite astral-Grampa, Carl Boudreau. Remember that this is a composite chart between the New and Full Moons, located for Greenwich. So it's a global average that always expresses the nature of the opening square of the Lights. This is really a comment on your 2007 article on the 72 angels. I have been searching off and on (since about 2007!) for the historic background of the attributions to the 72 angels. I've followed most of the same tracks you have, but thanks for putting it all together for us, especially the early stuff, like the Bahir. Besides the Psalm verses in Kircher, it looks like for attributes (rather than just lists of names) we can only get as far back as Papus. But Papus says "according to Lenain." Do you have any idea who Lenain is? I'm not sure why the history of this small bit of esoterica is so imporant to me, but I'm still on the hunt! By the way, here are two other contemporary sources for the 72 angels: Lo Scarabeo oracle and book "Angel Voices" and "Birth Angels" by Terah Cox. Thanks again for the info, and let me know if you know about Lenain. Thanks for the feedback, rachelcat! If you have a copy of Papus, he has listed some of his sources on p. 149, giving the name (but not the date) of Lenain's book as _ le science Kabbalistique_. If I remember correctly this was published around 1810 (?). Papus mentions him several times. Poking around online I found this , do you read French? There's a whole conversation there for whoever can follow it. Seems as if the table of contents of Lenain's book is shown. Is there a chapter there that gives graphics, the talismans of the angels? I am very avid myself to see where the circular seals on the Papus pack originally come from. If you find an online copy of Lenain's angel-seals, will you please come back and tell us? You'll see he gives us a set of seals taken from 'the well-known 16th century cryptographer Blaise de Vigenere'. So there's an even older lead to follow. Ok, just found the date for Lenain's book: 1823. His full name is Lazare Lenain. He was inspired by Etteilla and D'Odoucet. Interesting! Hey, thanks for asking, this has been a very profitable investigation.